Santosh Min B said he wanted the biometric details as the data would be of no use to UIDAI after the death of his father and that there could be chances of data misuse and abuse. New Delhi: In a rare case, a human resources manager from Bengaluru moved the Supreme Court on Thursday seeking a direction to the UIDAI to return biometric data collected for Aadhaar card of his father who died. Mr Santosh, who works with an ayurvedic clinic, linked his father's death to the humiliation that he felt when he tried to file his life certificate at a provident fund office in Bengaluru. The system could not authenticate his identity due to faded fingerprints and a cataract surgery. A five-judge constitution bench headed by Chief Justice Dipak Misra gave the petitioner two-minutes to argue his case in which he said that the Aadhaar scheme is like an "undeclared emergency". "This court may direct the Unique Identification Authority of India (UIDAI) to hand over my dad's biometric in a printed form, so that I can keep it for posterity," he told the bench that comprised justice AK Sikri, AM Khanwilkar, DY Chandrachud and Ashok Bhushan. He also sought abolishing of the Aadhaar scheme and said that "his father had passed away on December 31, 2016, the dark day in our history, as on that day demonetisation ended". The bench interrupted him and said, "We will not allow you to give any speech. If you want you can argue on question of law, but you can't be allowed to give a speech". Santosh, who appeared in person before the court, said that he had received a half written letter of his father N Bhanu Vikaraman for the Prime Minister in January this year. In the letter, his father had written about the "harassment" a sick and elderly person faces during filling of life certificate form at provident fund offices throughout the country. 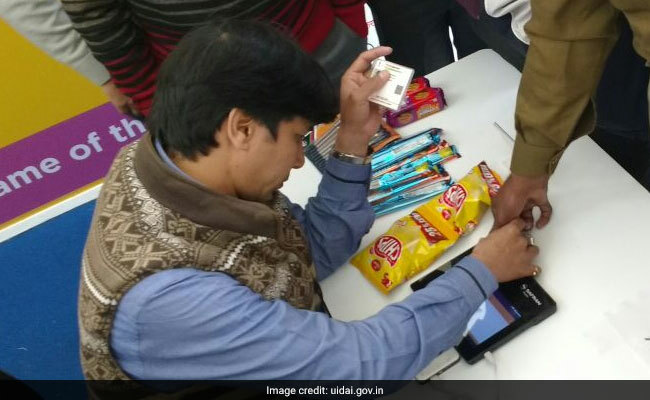 "In imposing the Aadhaar, the government of the day wanted to keep track of every single paise earned by the citizen and on other hand political parties can receive funds anonymously through electoral bonds," Santosh said in his submission. He said that since his father is dead now, the biometric details would be of no use for the UIDAI and moreover there were chances of their misuse and abuse. The bench, took on record his submissions and posted the matter for further hearing on March 20. The bench, is hearing a clutch of petitions challenging the constitutional validity of Aadhaar and its enabling Act. Senior advocate KV Vishwanathan, appearing for activist Aruna Roy, continued his arguments today and said that the use of the Aadhaar infrastructure by private entities is unconstitutional and authorising the use of the "Aadhaar number" as the sole proof of identity for an open-ended and unspecified set of laws or contracts, defeats the principle of informed consent at the time of enrolment. "The broad and unlimited scope of activities covered under section 57 of the Act and the kind of private entities permitted to use Aadhaar is entirely disproportionate, beyond the Aims and Objectives of the Act, and without any compelling State interest," he said. KV Viswanathan said that the Act also fails to specify the purpose for which the Aadhaar number may be used to establish identity, and whether it is necessary, given the alternative, existing modes of identification. "Finally, no procedural safeguards govern the actions of private entities, and no remedies exist for authentication failures or service denial," he said. Attacking the Aadhaar Act of 2016, the senior lawyer argued that section 7 of the Act was unconstitutional and violates Article 14. "The requirement under section 7 for every person to undergo authentication to avail benefits/services/ entitlements, falls foul of Article 14 since, first, such mandatory authentication has caused, and continues to cause, exclusion of the most marginalised sections of society," he said. He added that this exclusion is not simply a question of poor implementation that can be administratively resolved, but stems from the very design of the Act which is the use of biometric authentication as the primary method of identification. "In questions of infringement of fundamental rights, courts have to decide on the proportionality of an imposition with greater scrutiny, when the primary decision maker (the State and UIDAI) did not give due weight to the competing balancing rights at stake," he said and concluded his arguments. Senior advocates Anand Grover and Meenakshi Arora also addressed the court for the petitioners and termed the Aadhaar and its enabling Act as unconstitutional and in violation of fundamental rights. Yesterday, the top court was told that the collection of biometric details of citizens by UIDAI from 2010 onwards till 2016, when the enabling Aadhaar law came into force, was "illegal" and "invalid" and the collected data deserved to be destroyed. The Supreme court had earlier extended the March 31 deadline for mandatory linking of Aadhaar to avail various services and welfare schemes run by the government till it delivered its verdict on the validity of the 12-digit biometric number and its enabling law.